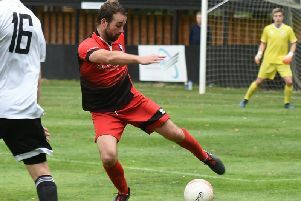 Lewes boss Darren Freeman spoke of his frustration after watching his side concede two late goals to lose a seven-goal thriller against ten-man Worthing last night. The Rooks led 3-2 late on, but substitutes Ollie Pearce and Joseph Clarke turned the game on its head after seeing Danny Barker sent off for a second bookable offence. Barker himself opened the scoring, only for James Hammond and Ronnie Conlon efforts to give Lewes a half-time lead. Alex Parsons drew Worthing level, before Tom Day gave Lewes a 3-2 lead – an advantage they would hold until three minutes from time. “I thought Worthing came and passed the ball really well. They caused us problems early on but we got to grips with how they were playing,” said boss Freeman.